← HIGHLY RECOMMENDED: 2011 Domaine du Tariquet “Classic” white blend (45% Ugni Blanc, 35% Colombard, 10% Sauvignon Blanc, 10% Gros Manseng), Côtes de Gascogne. 11.5% ABV, available for as little as $6.95 online. This wine is so stinkin’ delicious, I am heading to the wine shop later today to pick up their remaining stash. It’s the most exciting red wine I’ve had in a long time. It has the soaring high notes typical of a good Cabernet Franc, with alto floral notes, and depth from a foundation of black cherry and truffles. 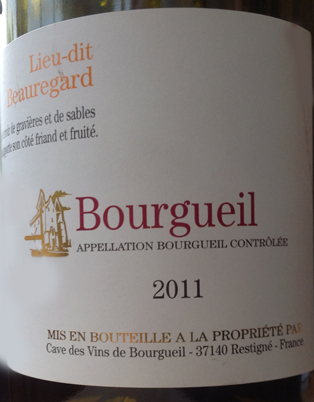 The Cave is a cooperative that was founded in 1931; the Bourgueil AOC was approved in 1937. Unlike most of the wine produced in France’s Loire River Valley, Bourgueil is red. Made from 100% Cabernet Franc, this wine is from vineyards in a small valley in Restigné, known as Beauregard, which used to belong to the St Martin’s church. The vineyards face south for maximum sun exposure. Top soils are alluvial flint and gravel which capture warmth and help ripening, while deep clay sub soils, allow the 40 year old vine roots to extend, drawing in minerals and nourishment. Grapes are completely de-stemmed and fermented in temperature controlled stainless steel tanks to bring out the bright fruit character. This entry was posted in Cabernet Franc, France. Bookmark the permalink.